10 years ago I embarked on a mission. After an absence of roughly 10 years, I came back to Malta eager to depict all that we took for granted, the mundane, the everyday life that gives us our character as Maltese. I knew it wasn’t going to be easy to be a self-employed artist in a small country. I knew I needed to do a lot of sacrifices, forget about going out every weekend let alone the occasional holiday. I either had to commit fully or none at all. I was called crazy, that I should get myself a proper job, that I should be realistic and stop being a dreamer. 10 years ago I revived my childhood fascination for Maltese patterned tiles. Whilst cement tile-making workshops were closing down as business wasn’t profitable anymore and patterned tiles were being pulled out from old houses and thrown away as rubbish, I was going around taking photos of every cement tile pattern I came across. I salvaged tiles from skips, went into houses that were being demolished, made pleas on Facebook to be sent photos of patterned tiles one had at home or at their grandparents, took walking trips around different towns and villages in the hope of discovering more and more patterns and at times also asking to be let into houses. I started featuring the tile patterns in my ink drawings, depicting them as faithfully as possible. I was determined to bring their beauty back to life again and for people to rediscover and appreciate their uniqueness as well as the work involved into handcrafting these tiles one by one. Along with the tiles, I also wanted to revive an appreciation for Maltese doors. Their various colours, their woodwork and ironwork, their doorknobs and doorknockers…so many doors, so little time! In 2011, I launched a series of original works where I focused solely on the doors ~ each (relatively small) ink drawing demanded some 40 hours of my time as I worked relentlessly and meticulously to bring these local gems more to the forefront of everyone’s attention. I wanted people to look closer. But I still wasn’t happy with my efforts. I had a lot of material and also a lot of passion. I wanted more people to share in my enthusiasm. Since I couldn’t bring the tiles back to the floors, I thought of bringing their patterns onto walls, into kitchens, on desks, in dining rooms and on tables, and onto objects of every-day life. This prompted me to create my own line of products. I took the same approach with my door drawings. 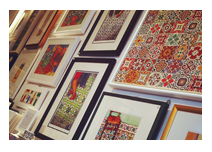 Today, 10 years later, I am pleased to see that cement tile-making workshops are back in business; flattered that the Mcast students have used my tile collage concept for their 2017 projection onto the GrandMaster’s palace; honoured that Maltapost took the initiative to approach me to design a set of stamps featuring tile patterns after seeing my Mug Collection; delighted that the tile patterns have been lavishly used during some of the V18 celebrations and that other artists and designers have taken on the Malta tile and door themes and included them in their work. I am happy that these subjects have become somewhat trendy and are being appreciated by the younger generation. Is it a mission accomplished? I would love to think that my work contributed towards reaching some of the goals, but it definitely cannot stop here. From my end I know that having archived over 250 different tile patterns isn’t enough. I also want to reach more people both locally and abroad as that’s my personal way of promoting my country, and yes, of course I also want to sell more because unless I do, I can neither pay my bills nor create more work. The focus on these subjects must not stop when the trend is over so more needs to be done to preserve our heritage. More support to artists and craftsmen, especially those working in the cottage industries must be offered so that traditions are passed on from one generation to the other in a world where everything is mass produced and handmade items aren’t always financially sustainable. And allow me to add, there also needs to be more respect and awareness to ethics and copyright amongst students and professionals alike as well as the general public. Don’t stop dreaming as long as you’re willing to work for it! 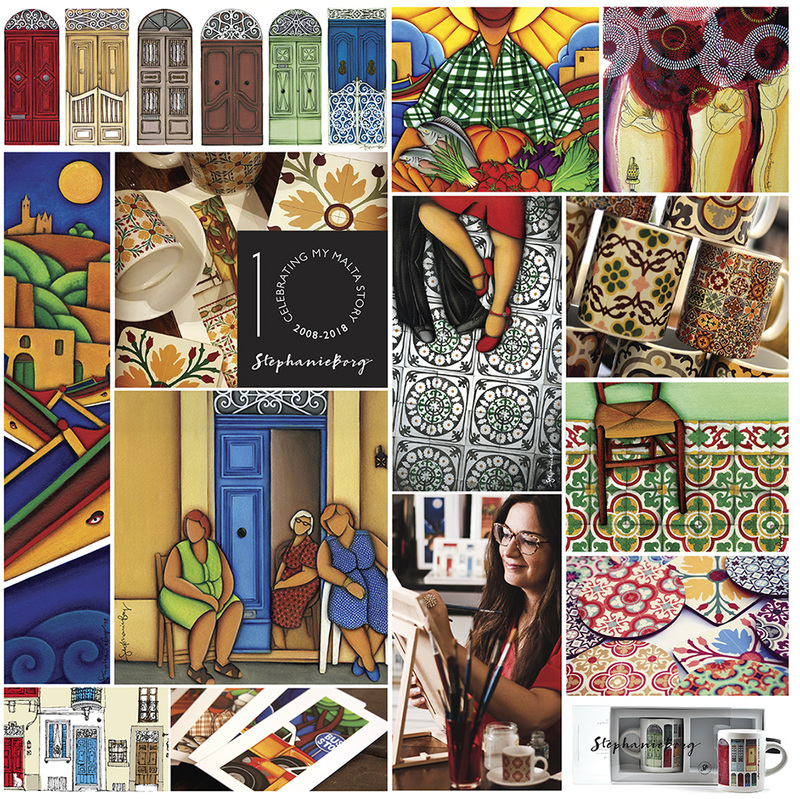 As part of the celebrations, the artist is giving away a Set of 5 Malta Tile Pattern Magnets with purchases of over 100€. Offer is valid until stock lasts.